Our radiation protection doors/ shielding doors/ neutron doors are individually produced according to our customer’s specifications and legal requirements. Given our professional maintenance they are constructed to have a life span of several decades. Aside from constructing new doors, modifying and reconstructing existing door systems is also one of our specialties. 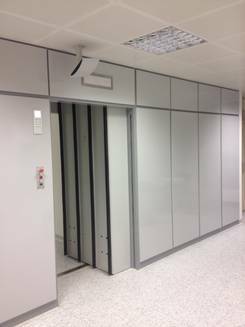 The weight of our radiation protection doors varies based on the project but is usually in the two-digit ton range, nevertheless heavier doors are feasible and have been built before. Generally, we distinguish our products between a sliding- or revolving door, ground-driven or hanging. A smooth operation of the shielding door can be ensured by our special drive construction with a frequency-controlled, three-phase electric motor. The frequency control allows for a smooth acceleration, regular movement with increased speed and a smooth slowing shortly before reaching the final position. Our specific programming of the control system reduces wear on the wheels, chains and gears and minimizes the noise level. Due to the movement with elevated speed, the time for opening and closing the door is reduced and therefore a higher throughput can be achieved. The drive system is designed to simultaneously ensure a maximum operating comfort, safety and maintainability. The radiation protection door system can be controlled via the operating panel. Safety contact strips: Depending on the door-leaf thickness and in accordance to safety regulations, one or several safety contact strips are attached to the main closing edges at the door leaf. Activating those leads to a change in direction of the door leaf movement. Safety light curtain: If the safety light curtain is interrupted while closing the radiation protection door, the stop-function of the door leaf is automatically activated which prevents from being squeezed. Forced contacts: Potential-free, compulsory-separating safety switches are installed to clear the radiation facility when the radiation protection door is closed. Besides those safety systems as a standard equipment, we offer our customers an optional personal protection system, which ensures that when starting the radiation source, no unauthorized persons are present inside of the radiation room/ bunker. Our hanging doors can be opened automatically upon request without any technical equipment in case of a power failure. 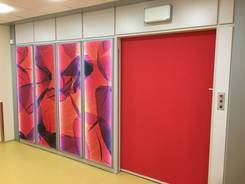 We can provide you with detailed specifications of all of our radiation protection door types upon request.